These containers are straight-sided, short jars made of clear glass. The lids are made of polypropylene and are lined with a solid Teflon/PTFE liner making them ideal for all of your liquid and dry storage needs. The clear flint glass jars offer maximum content visibility and the Teflon (PTFE) lined closures provide for good, tight-sealing properties making them suitable for storage of all types of chemicals, solvents and solutions. 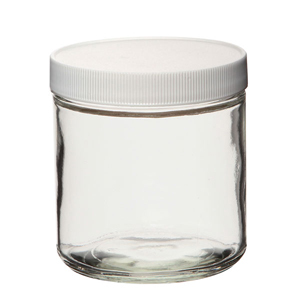 These jars are available in either a Standard Grade or Certified Clean Grade. The Standard Grade jars are packed straight off the factory assembly line without any extra cleaning process performed. The Certified Clean Grade jars are Level 1 containers that meet full EPA quality assurance standards and are lot number labeled for traceability. A Certificate of Analysis is issued for each case. Both jar grades have exactly the same container, lid and PTFE liner. Container sizes 2oz (63ml), 4oz (125ml) and 8oz (250ml) are all packed 24 jars per case whereas the 16oz (500ml) and 32oz (1000ml) jars are packed 12 per case.